Icaro Healing Song Training in Bristol with Richard Down. 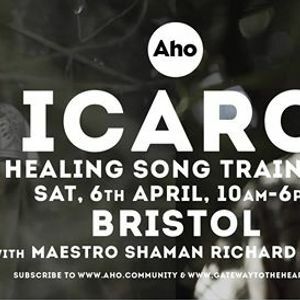 Aho Studios presents Maestro shaman Richard Down’s Icaro song training - proudly in association with co-hosts, Snailspace Therapies and Fleur Yoga, Bristol. Join Maestro Richard in Bristol for this much acclaimed one day intensive training known internationally for his work with healing song, sound healing and peace initiatives. Over the last ten years his work has been described as producing sudden and dramatic healing results in individuals and audiences, trails of testimonials and references to his work can be found on social media and throughout the internet. On the day of the intensive you will receive an attunement from my own medicine World followed be intense practical information and exercise. You do not have to have a great perceived singing voice - that will come as a result of this training. This intensive is for everyone - from facilitators, energy healers to people interested in song and vocal ability. Although this may seem like a lot of information to absorb in one day you will find it naturally flows. It will be great fun at times! It will be a profound gift for life. The Investment for this training is reflected in its speciality rarity and huge benefit. Payment in full £160. This training is limited to 20 places. NOTES ON DEPOSIT: The ticket price is £160... £100 of which forms a non - returnable deposit. If you cannot make the course you must tell us in advance. You may be able to join another workshop in another location on the next available date.